The soffit area of your exterior plays a important role in allowing proper ventilation for the roofing system and attic of your home or building. Whether working with old wood soffits that need proper ventilation and updating, or removing aluminum soffits that were installed incorrectly, the team at Charleswood will help recommend solutions to achieving ventilation from the soffit area to help you maintain your home for many years to come. The Fascia boards are the visible boards of a building that horizontally cap the end of rafters, or the outer vertical face board along the gable end. Installing aluminum onto the fascia boards is a protective measure to the structure of your building. Aluminum fascia also provides a aesthetic upgrade to your building’s exterior. 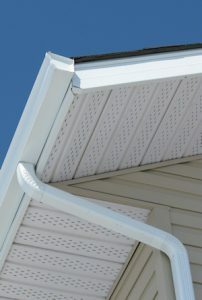 Aluminum Fascia combines with other areas of your exteriors – typically: soffit, eaves trough and siding. Our Professional staff will help you choose a colour scheme that will compliment your home. Click here & submit a estimate request today to schedule a appointment with one of our staff.